I was delighted to see that my other feature about Russian bloggers turned out to be insanely popular. The blog of yours truly is often found by keywords “Russian fashion blogger”, so, as I may not be exactly what you are looking for because I’m FROM but not IN Russia, I will regularly post about other fabulous bloggers who is 100% Russian (or Ukrainian! Ukrainian bloggers, get ready :)). 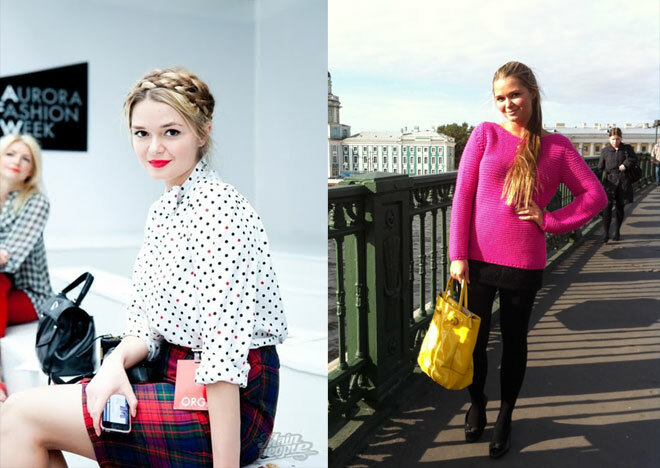 And do you know what is great about Russian style bloggers? Most of them write both in Russian and English! Anastasia Kuzmina from Moscow is a professional blogger, freelance journalist and a dreamer. She dreams about living in a beautiful country where sun always shines and all people are beautiful. She doesn’t actually write about any of these things, it is just the feeling that you get while reading her blog, so I visit it often for a blast of positive energy. Fashion Mind is both a style and inspiration blog by Nataly Romashko, a make up artist and stylist from St Petersburg. Apart from posting her own looks she writes about everything beautiful and unusual, from cabbage dresses to Britney Spears. Kamilla from Kazan has a fun and eclectic style. She is an expert in mixing the unmixable, clashing colors and constantly shifting her style from rock chic to feminine. A group of street style bloggers from St Petersburg with an unmatched sense of humor. I love reading their comments maybe even more than the looks themselves. So many blogs of different styles. I really enjoy reading other blogs about dressing style. Some can inspire me of changing better style. I love the simplicity of the outfit, perfection! The accessories makes you and your dress more attractive. very nice blogs!! any men’s Russian fashion forum? ?